Forget Black Friday! Wait a week and join us for a very colorful Saturday sale, with lovely, eclectic, and unique gifts that you can feel good about. On Saturday, December 7, from 1-4pm at the Green House, our ART FOR ALL crew is hosting an Open House and Holiday Sale. Come celebrate the season, share some holiday refreshments, and see the beautiful and creative arts and crafts made from “up-cycled” material at our ART FOR ALL weekly workshops this fall. 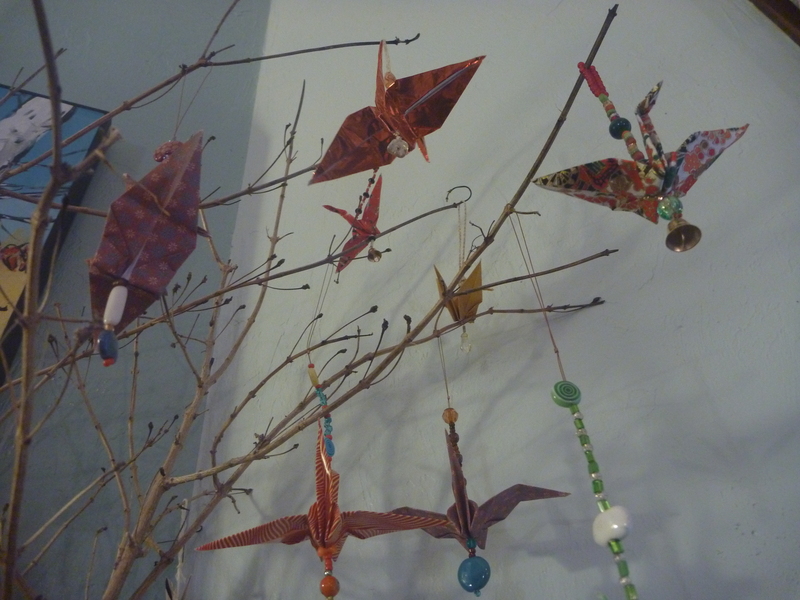 Items include homemade jam, ornaments, earrings, paper cranes, and more, and would make wonderful gifts. 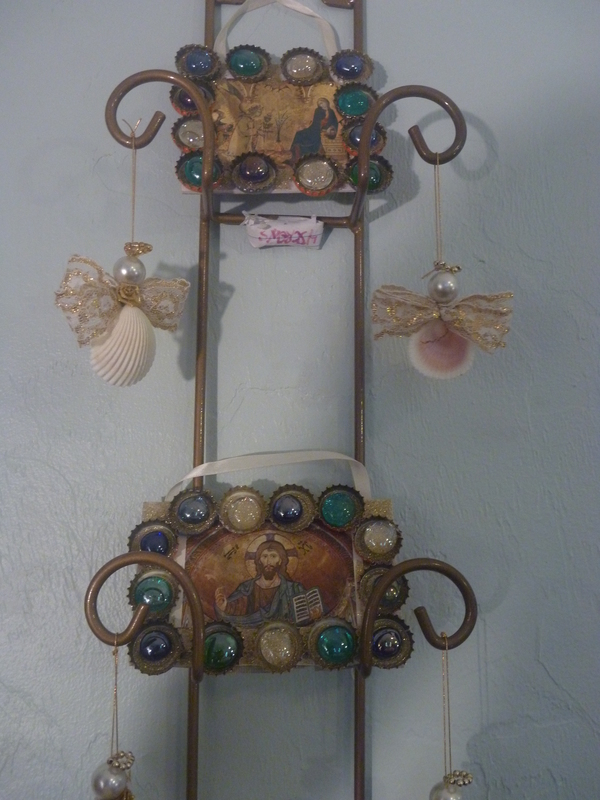 Proceeds support the Gainesville Catholic Worker and participating artists. The GCW “Green House” is located at 218 NW 2nd Avenue in downtown Gainesville. We are happy to announce that the Art For All group is ready to get going with meetings on Saturdays from 2 – 5 pm at the Green House starting this coming Saturday, October 12. We will be focusing the next two months on crafting items (including home-made jam) for our upcoming open house and holiday sale. No crafting experience is necessary and all materials are provided. Children are more than welcome and will be able to work on crafts of their own. Please join us and spread the word! A schedule of craft session is below. Also below is a wish list of needed items. December 7: Community Open House and Art For All Holiday Sale! With Bake Sale! Time to be announced. HOUSE NEWS: Join us on Friday…or Saturday…or Monday…. Lots happening over this last stretch of days before we take a one-week break between semesters! Here’s what you need to know, and we hope you can join us for one or more of these events! 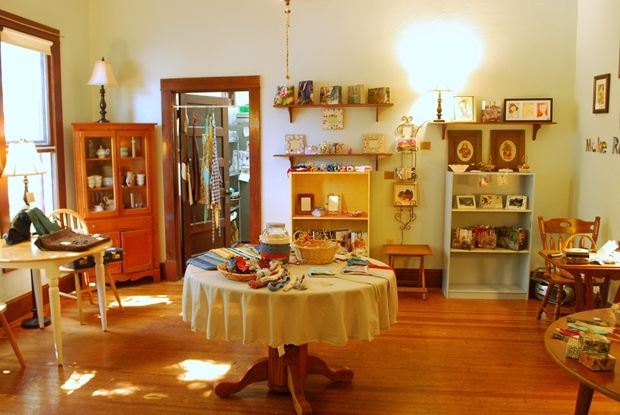 Citizen’s Coop, 435 S. Main Street, Be there on Friday night for the Art Walk and visit our table! TOMORROW, FRIDAY APRIL 26, WE’RE ON THE ART WALK! We’re so grateful to Citizens’ Coop for including our artists and crafters from Art for All in this Froday’s Art Walk, taking place from 7-10pm at a variety of locations downtown (click here to see and print out a map). 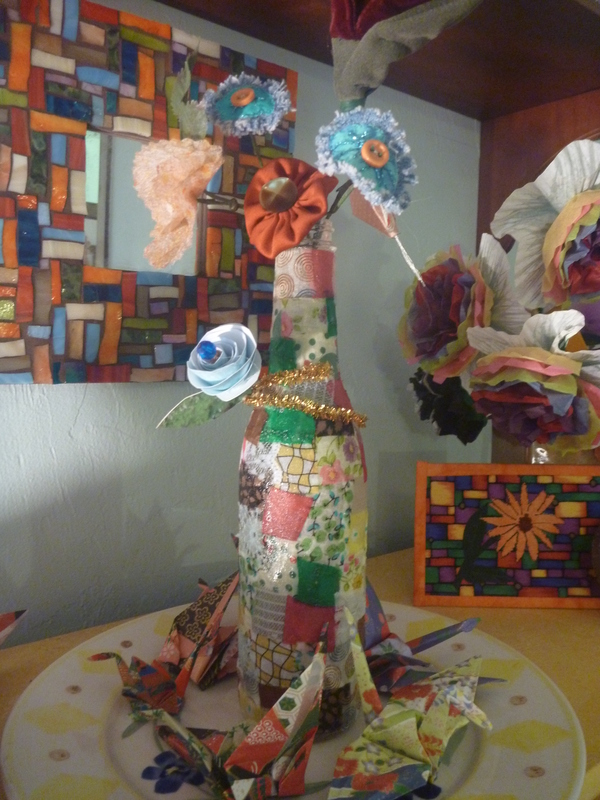 We’ll have a table at Citizens’ Coop, displaying and selling items made by our cadre of artsists and crafters who gather each Saturday at the Green House to make beautiful things from recycled materials. So if you have a chance to drop by the table and say hello and maybe purchase something, we would be so grateful! 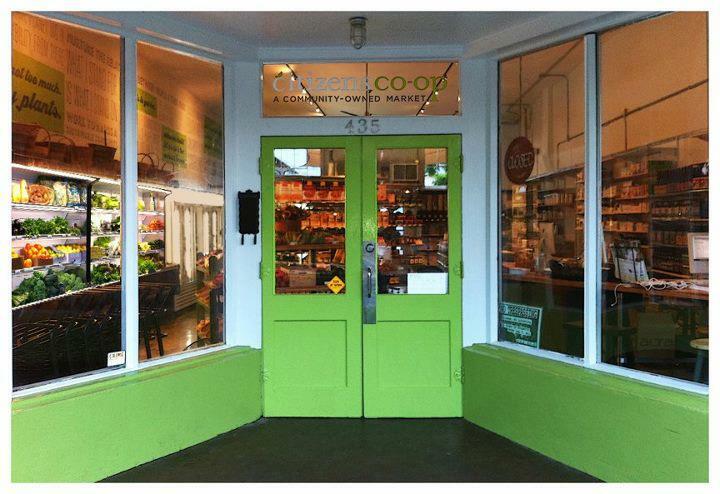 DROP BY CITIZENS COOP AND HELP SUPPORT THE GREEN HOUSE: And speaking of Citizens Coop… Don’t forget to that all this month (five more days! ), Citizens Coop is featuring us, The Green House, as the object of their “Be the Change” campaign. Set up at each register in the store is a glass jar and information about the Green House. Customers can drop their change into the glass jars and at the end of the month, the Coop will direct all the proceeds to us. They’ll be doing this every month, focusing on a different group, and we’re lucky enough to be the very first one! So drop by the Coop, pick up some great food, and drop your change in the jar! Come on Friday night at visit the Art Walk table and drop some change in the jars! SATURDAY, APRIL 27, MONTHLY WORKDAY AT THE MICROFARM: If you have not visited Jade and Lynn’s microfarm, you don’t know what you’re missing! They have done incredible things at Black Acres Microfarm, and each month, we host a workday at the farm to help give back for all the produce they send our way each week for us to share with people who don’t get much good, healthy food. Come this Saturday and help out with basic farm chores, anytime between 9am and noon. BAM is located at 415 NW 32nd Street, near to the Publix Shopping Center on 34th Street and University Avenue. 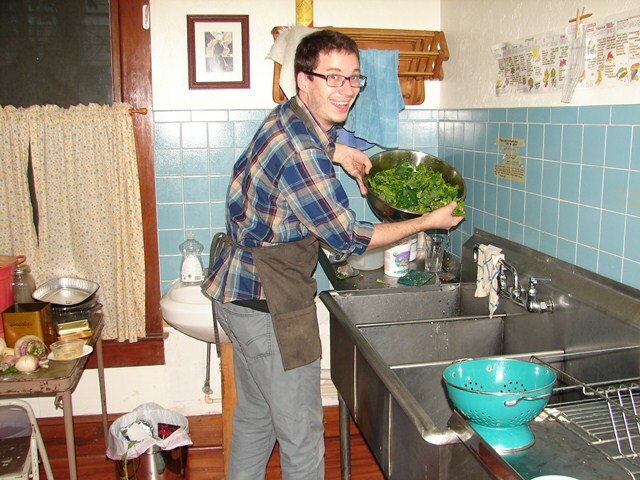 MONDAY, APRIL 29, END OF THE SEMESTER PRAYER SERVICE AND POTLUCK: Each semester we are so lucky to have a group of people make a commitment to live and work at the Green House, and when it the semester ends, it is always hard to say good-bye. So at the end of each semester, we host a special prayer service and potluck dinner, to thank these young folks and send them off with our blessing to continue the work they’ve begin here wherever their journey may take them. So on Monday, April 29 at 6:30pm, we invite you to join us in saying good-bye and thank you to Vickie, Gloria and Clayton. Vickie has lived with us for two years now, and volunteered for several years prior to that. Gloria and Clayton also volunteered for several years and spent the past year living at the house. We hope you’ll come, share stories and memories about them, and join us in blessing them as they move on from Gainesville into new and exciting endeavors. If you can bring a dish to share, that would be great! The prayer service will begin at 6:30pm with the potluck dinner to follow. 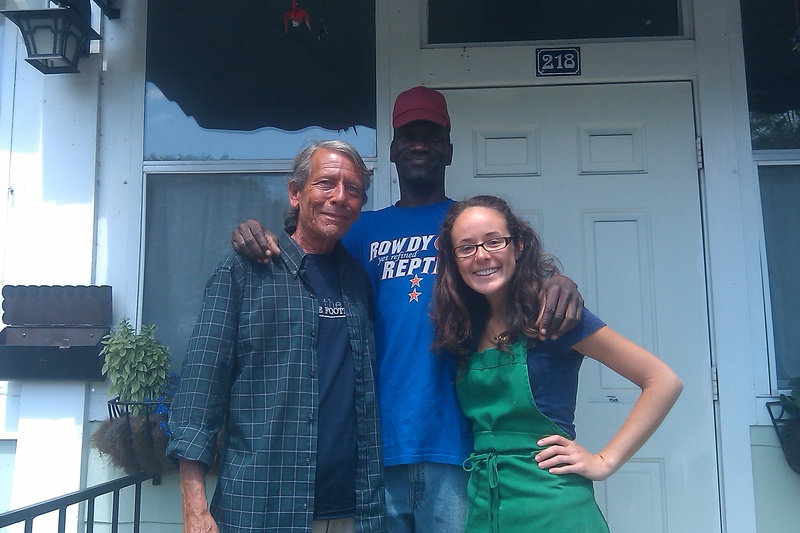 And besides our live-in community members, we always like to give thanks to anyone who has spent time volunteering at the Green House during their time in Gainesville. So come by and let us know if you’ll be leaving after this semester or over the summer can we give you a proper thank you! NEEDED: TUESDAY MORNING VOLUNTEERS! 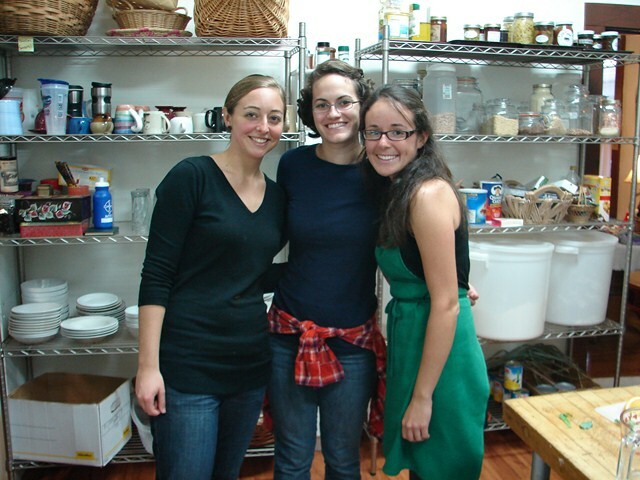 We’re short-handed on volunteers for Tuesday’s breakfast and could use 1-2 regulars, between 7-9am. (We could also use a second volunteer on any of the weekdays beginning with May and running through June!). Let us know if you’re interested and can help out. ON BREAK FROM MAY 5-12: We’ll also be taking a short break, May 5-12, while UF and Santa Fe are on break between semesters. We’ll start back up with a summer schedule for May and June on Monday, May 13th. Check the website soon for more info on what will be happening during May and June. First off, a quick thank you to everyone who helped out this weekend preparing for and then participating in the big Art for All Open House and Sale. We had a great turn-out, much pie was eaten, and many folks helped support the house by buying some of the items created this past semester at Art for All. We’ll continue to display items throughout the next two weeks, so if there is something you might like to purchase, stop by any weekday and you can look at what is left (someone is always on duty between 1-5pm, but you can stop by anytime). We’ll also be displaying at the Art Walk on Friday, April 26, so come by and see us then (more info in next week’s email). 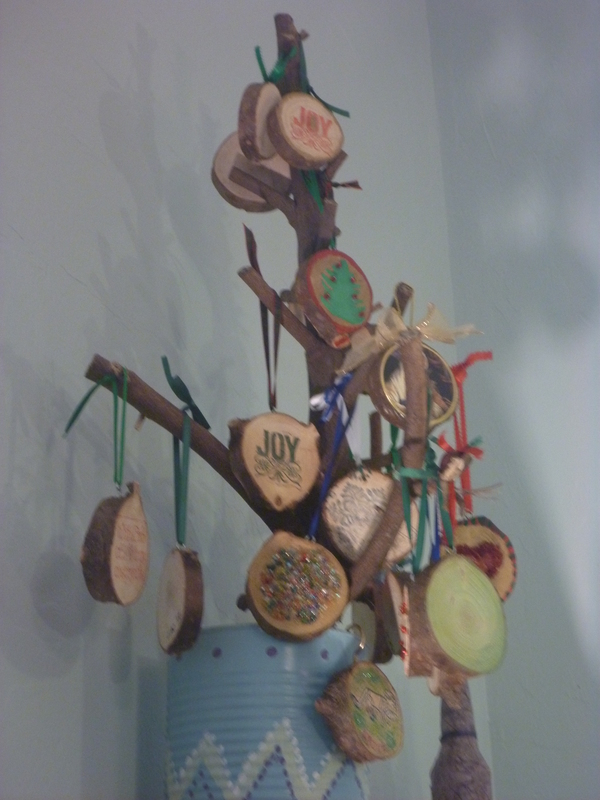 You can click here to see some of the items created at Art for All. ROUNDTABLE THIS WEEK ON INTENTIONAL COMMUNITIES: This week, we’re really excited to have back with us Whitney Sanford, UF professor of religion, to talk about “Sustainability, Autonomy, and Resilience: Lessons from Intentional Communities.” The roundtable will be on Thursday at 6:30pm at the Green House. Here’s a short description: “Intentional communities such as Catholic Worker Houses and Farms, ecovillages, and Transition Towns, demonstrate alternatives, including voluntary simplicity, regional economies, and community responsibility. What can we learn from these communities, and how do these lessons translate beyond these communities?” Bring a dish to share if you can! COMMUNITY PRAYER SERVICE ON SUNDAY: This Sunday, we’ll be hosting a community prayer service and potluck dinner at the Green House, from 4-7pm. A small group of folks have been meeting monthly to worship together, plan activities and share a meal. Everyone is welcome to join us. Bring a dish to share if you can! Thanks for all yor support! ART FOR ALL OPEN HOUSE (WITH HOMEMADE PIES!) THIS SUNDAY, APRIL 14: Each semester, a group of artists and crafters from among our house community, former guests and community members, volunteers, and friends who live on the street meet every Saturday to encourage each other’s creativity. They make beautiful objects of art and wonderful and useful crafts from a whole host of found and recycled items–old calendars, t-shirts, bottles, magazines, and such. These items get “up-cycled” to make vases, gift bags, rugs, paper flowers, ornaments and more (click here to see some Art for All creations). And at the end of each semester, we host an Art for All Open House to share with the larger community these beautiful works of love. The Art for All Open House will be this coming weekend, on Sunday, April 14, from 1-4pm. Stop by to see the work of these artsists and crafters, enjoy a slice of homemade pie, and maybe pick up a Mother’s Day (or graduation) gift. Please invite friends and others! A WINDOW INTO THE WORLD OF THE GREEN HOUSE: Kelli wrote a really beautiful piece that I think captures a slice of our life at the Green House. The post is on her blog, What We Need Is Here, and it is entitled “Mercy.” You can find it by clicking here. Check it out when you have the time. Hope you’ll stop by this weekend, Sunday from 1-4pm, and share a piece of pie with us! HOUSE NEWS: Busy, busy busy! Join us this week for Art for All Sale, End of Semester dinner, etc.! ART FOR ALL OPEN HOUSE AND SALE ON SATURDAY: GCW members, volunteers, guests and friends from the street, under the direction of local artists and crafters, have created a variety of beautiful and unique artwork and crafts this spring. Part art therapy, part cottage industry, part celebration of creativity and community–the process and results have been enjoyed by everyone involved. The creations are eclectic and employ skill, attention and creativity to transform used, everyday items into something beautiful and useful. All proceeds go to support the Gainesville Catholic Worker and participating artists. These items make great gifts for graduation and Mother’s Day while supporting the dignity and creativity of the artists and crafters. The sale will take place on Saturday, April 28, 1 -5pm, at the Green House of the Gainesville Catholic Worker, 218 NW 2nd Avenue. 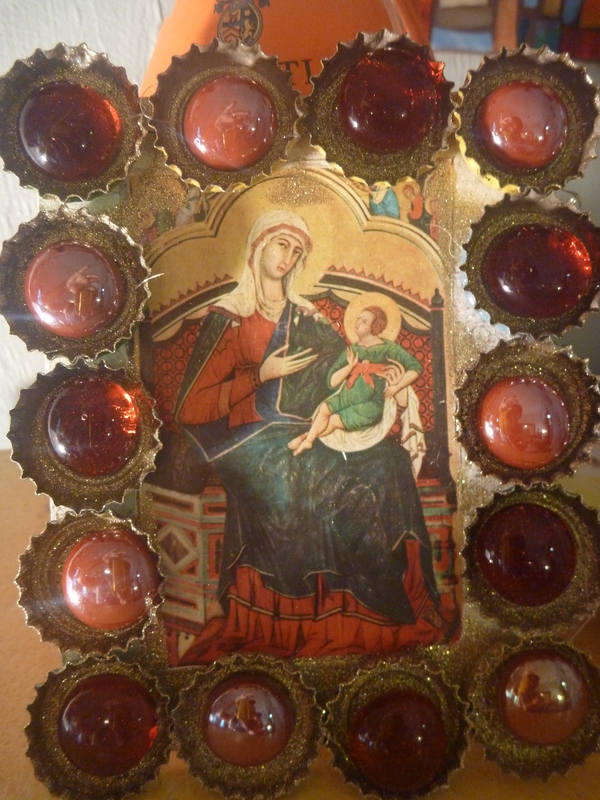 You can also view some of the items for sale on the GCW website by clicking here. Come visit the house and gardens, enjoy a piece of homemade pie, and see if there is anything you might like for yourself or someone special. Please help us advertise the sale by spreading the word, inviting your family and friends to come, forwarding this email, posting on Facebook, etc. If you want to help at the sale and open house, let us know! END OF THE SEMESTER PRAYER SERVICE AND POTLUCK DINNER: Join us on Thursday evening, from 6:30-8pm, as we wrap up another semester with our end of the semester prayer service and potuck dinner. We’ll be thanking Tamra for her service here at the house as she graduates and moves on to medical school, as well as recognizing other volunteers and friends who will be leaving Gainesville after this semester. If you’re graduating or moving on, please come by and join us on Thursday night so we can say thank you and good bye! Bring a dish to share if you can! Everyone is welcome to join us. GET YOUR PORTRAIT TAKEN AT THE GCW THIS WEEK! Tamra’s boyfriend, Ben, a professional photographer, will be with us during the cafe on Wednesday to take portrait photos of our friends, volunteers, guests, and anyone else who wants to show up. We’ll be displaying some of the portraits at the house next year and everyone who gets their photo taken gets a free copy to keep or pass along to a loved one. Come anytime between 11am and 3pm, enjoy some lunch and have your picture taken. MMMMMMM, PIE… In preparation for Saturday’s Art for All Open House and Sale, we’ll be making homemade pies in the afternoon on Thursday and Friday to share with patrons, shoppers and friends at the sale. Come help us bake and prep for the sale. Email Kelli at gvillecw@yahoo.com for exact times if you want to come and help. HOLY CANNOLI BATMAN, THEY’VE PUBLISHED A NEWSLETTER! Yes indeed we have. The new copy of Conspire, the GCW Newsletter, is now available at the house and online. You can click here to read the Spring 2012 edition online. We’ll be sending out hard copies to everyone on our mailing list later this week (let us know if you want to be added). This issue includes info on the Art for All sale, former GCW Kim Hunter’s speech given when she was awarded the Jack Penrod Award for Peace and Justice, a reflection on addiction by Kelli, and the House Letter. Hope you enjoy! 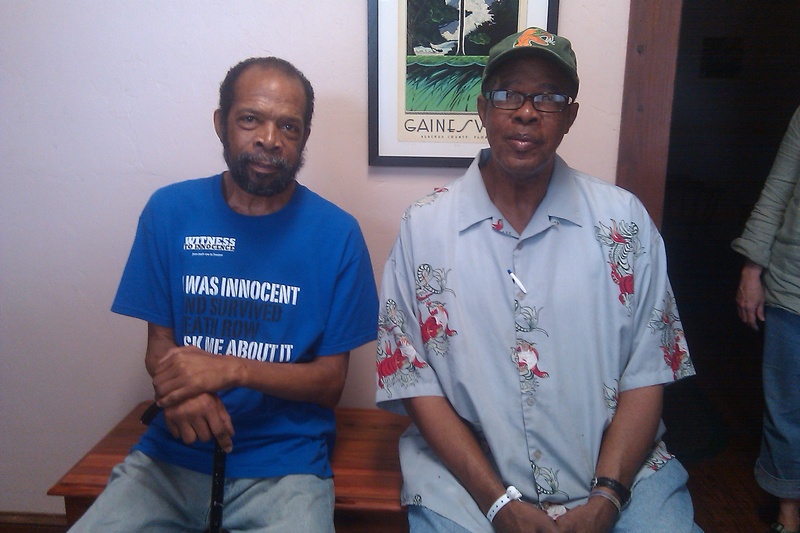 David Keaton, first death row inmate exonerated in Florida (on left) and his cousin Alphonso. Lastly, even as the semester winds down, we hope some of you who are sticking around can help out in May and early June. We’ll keep several of our projects going through the middle of June and can use help with things like the cafe, Breakfast Brigade, etc. Thanks! Save the Date! Spring Open House and Art for All Sale: April 28! Join us for our Spring Art Sale and Open House! GCW members, volunteers, guests and friends from the street, under the direction of local artists and crafters, have created a variety of beautiful and unique artwork and crafts this spring. Part art therapy, part cottage industry, part celebration of creativity and community–the process and results have been enjoyed by everyone involved. The creations are eclectic and employ skill, attention and creativity to transform used, everyday items into something beautiful and useful. All proceeds go to support the Gainesville Catholic Worker and participating artists. These items make great gifts for graduation and Mother’s Day while supporting the dignity and creativity of the artists and crafters. The sale will take place on Saturday, April 28, 1 -4pm, at the Green House of the Gainesville Catholic Worker, 218 NW 2nd Avenue. Come visit the house and gardens, enjoy a piece of pie, and see if there is anything you might like for yourself or someone special. Please help us advertise the sale by spreading the word, inviting your family and friends to come, forwarding this email, posting on Facebook, etc. If you want to help at the sale and open house, let us know! ART FOR ALL STRETCH RUN: Later this month, we’ll hold the second of our biannual Art for All sales. These sales feature the work of some of our friends from the street as well as numerous friends, volunteers, local artists and crafters, etc. The money raised from the sale benefits the GCW and those artists who are homeless, unemployed, or otherwise struggling to make ends meet. For the next few weeks, if you’d like to help us recycle, up-cycle or create items for the sale, we would love to have you join us at the Green House Knitters gathering on Monday nights (7:30-9:30pm), at Art for All on Tuesday afternoons (1-3pm), during the Cafe on Wednesday (12:30-2:30pm) or on any one of several Saturday project days to be announced later. We’ll have donated materials ready for you to use and instruction for those wanting to help create. AND… if your church or school or community group wants to help us sell the arts and crafts after a service, at a meeting, etc., we’d love to make arrangements to come and help facilitate this. Just contact us at gvillecw@yahoo.com and we’ll work out the date and details. We also have a long-time friend of the house who is in need of a used working laptop. He lives in his car and had his computer stolen out of the car a few weeks ago when someone broke a window to get in. Our friend was quick to point out that it is NOT a necessity for him, but that it was helpful for researching job opportunities, connecting with his family, and enjoyment. If anyone has an old laptop they were thinking of donating somewhere, we could cut out the middleman for you and get it to this person directly. Lastly, we had a fellow request a pair of size 13 sneakers at the cafe last week. We get in shoes every once in awhile, but I told him size 13’s didn’t often come in. I told him I’d ask around in case one large-footed person wanted to do another one a solid.